LONDON, England — It’s the world’s oldest and most prestigious tennis championship – Wimbledon, held at the All England Club In London since 1877. Although steeped in tradition, the facility takes a decidedly modern approach to its audio and communications network, evaluating and updating its installation every year. 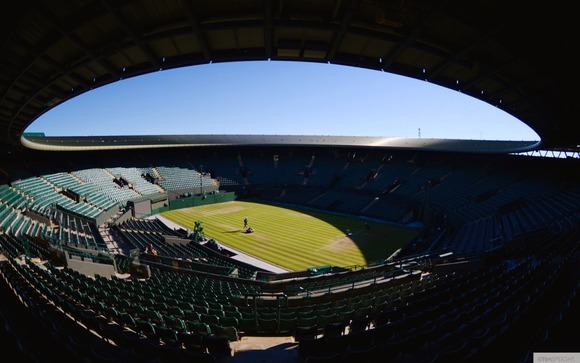 Prior to the 2014 tournament, Wimbledon-based systems contractor RG Jones Sound Engineering (www.rgjones.co.uk) knew that the scope of work would be much more involved than in the past. Because of building renovations, the Broadcast Center PA equipment room had to be completely relocated, and the system upgrade called for more audio inputs and outputs than the existing system provided. Jon Berry, RG Jones Sales and Installation Director realized that HARMAN’s Crown DriveCore Install (DCi) Network amplifiers and BSS Audio BLU-160 signal processor made such a major undertaking a lot easier, because of their ability to be networked with the All England Club’s existing Soundweb London audio DSP system, which operates across the site in locations including the Centre Court clubhouse, the North courts, the Gate 3 turnstiles building and other areas. RG Jones installed a total of 24 Crown DCi 4|300N and DCi 4|600N four-channel amplifiers in the new PA room, as well as two BSS Audio BLU-160 processors. All Crown and BSS Audio products were supplied by UK HARMAN distributor Sound Technology, Ltd.
Crown’s DCi Network amplifiers utilize exclusive DriveCore amplifier technology, which enables powerful, energy-efficient operation from an amplifier just 2U rack spaces high. The ampifiers are compatible with HARMAN’s HiQnet Audio Architect™ system setup and control software. The amplifiers receive audio from the BSS BLU-160 processors via BLU link, a low-latency 256-channel fault-tolerant bus, which provides the required channel count and a cost-effective hardware solution that can be implemented over long distances. “Having to implement such a major overhaul of the system proved to be a blessing in disguise, as the relocation of the PA room confirmed our belief that network-compatible amplifiers were the way forward,” said Berry. “The ability to network the amplifiers alongside the existing Soundweb London system has proven to be extremely useful. Having in-depth, instantaneous monitoring of the amplifiers gives us a degree of control that was simply unavailable before.” He also noted that the amplifiers’ Ethernet connectivity significantly reduced the amount of analog cabling that would have otherwise been necessary. Berry has been equally impressed with the DCi Network amplifiers’ performance. Before starting the All England Club project RG Jones undertook rigorous sonic testing at their workshop to check that the amplifiers would integrate with the existing system. “While conducting these evaluations we realized that the depth and functionality of the amps’ DSP features were a major advantage in tailoring their performance to the speakers, the system and the venue,” Berry added.